Whether you’re an avid outdoor enthusiast or someone who loves spending the afternoon in a comfortable living space, check out this new home at 16428 Bassett Dr, La Pine! 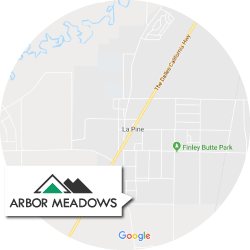 If you’re searching for new affordable homes in La Pine, Oregon, then Arbor Meadows will exceed your expectations. This community is located just a 1/2 mile from La Pine City Center, a 45-minute drive to Mt. Bachelor. As well, there is easy access to outdoor recreation sites like Paulina Peak, Wickiup Reservoir, Crater Lake and more! Our new affordable homes in Arbor Meadows are high-quality homes with open floor plans that will suit any lifestyle. Enjoy the great outdoors right from your new home in Arbor Meadows. Prices of homes starting in the low $200k! Contact us for the most up to date pricing. These are photos of a similar home and all info subject to change.